Are There Ideal Weight and Height Ratios? Weight-to-height ratio tables show you exactly what range your weight should be for your height, so you can easily see if you are overweight, underweight or healthy. There are other methods to know if your weight is healthy, including waist measurements, waist-to-hip ratio and body fat percentage, but height-to-weight is the easiest because all you need to know it how tall you are and how much you weigh. Your body mass index is determined by your weight and height. A simple chart shows you if you're in the normal range of 19 to 24, overweight at 25 to 29 or obese at over 30 BMI. Individuals under 18 BMI are considered underweight. While BMI is a good starting point for weight and height ratios, it isn't used for children, pregnant women or the elderly. In addition, a person's BMI may be misleading, as bodybuilders and athletes often have low fat reserves and, because muscle tissue weighs more than fat, weigh more than the average person of the same height. An ideal weight-to-height ratio indicates that you are eating and exercising at the appropriate amounts. If you discover you are underweight, gaining weight should be done by eating more nutritious food, not by quickly trying to put weight on with fattening food. Being overweight increases your risk of type 2 diabetes, heart disease, osteoarthritis and high blood pressure. Exercise, reducing your calories and cutting back on sugar and fat can help you get to a healthier weight-to-height ratio and body fat percentage. Adult females generally have a lower ideal body weight than men of the same height. Women have smaller frames, so they're generally lighter when at a healthy weight. For example, a woman under 100 pounds may be in her ideal weight range if she is shorter than 4 feet 10 inches tall, but a 100-pound male is within his ideal weight range if he is exactly 4 feet 11 inches tall. The ideal weight ranges for a 5-foot-tall woman is 90 to 110 pounds, 5-foot-1 is 95 to 116 pounds, 5-foot-2 is 99 to 121 pounds, 5-foot-3 is 104 to 127 pounds and 5-foot-4 is 108 to 132 pounds, according to Rush University Medical Center. The average height of a woman in the US is 5-foot-4. When considering the weight and height ratio, a 5-foot-5 woman should weigh between 113 and 138, 5-foot-6 between 117 and 143 and 5-foot-7 between 122 and 149. The weight and height ratios continue to increase at approximately 4.5 pounds at the low end and 5.5 pounds at the high end of the range, per inch of height. A 6-foot-tall woman's ideal weight range is 144 to 176 pounds and a 7-foot-tall woman's range is 198 to 242 pounds. Men have an ideal weight range similar to that of women, but their weights are higher per inch. A man who is 5 feet 11 inches tall has an ideal weight range of 155 to 189 pounds, which is significantly higher than the 140- to 171-pound range for women. Men under 6 feet tall can determine their ideal weight without consulting a height-to-weight ratio table by starting at 5-foot-11 and a weight of 155 to 189 pounds. Simply subtract 5 to 6 pounds per inch from the low of 155 pounds, and 6 to 7 pounds per inch from the high of 189 pounds. Thus, a 5-foot-5 man has a range of 122 to 150 pounds and a 5-foot-tall man has an ideal weight range between 95 and 117 pounds. Men who are 6 feet tall have an ideal weight range of 160 to 196 pounds. By adding 5 to 6 pounds for every inch over 6 feet to the lower weight of 160 pounds and adding 6 to 7 inches to the higher weight of 196 pounds, men may find their ideal weight range. For example, the ideal weight range for a 6-foot-5 man is 187 to 229 pounds, and the range for a 7-foot-tall man is 225 to 275 pounds, according to Rush University Medical Center. Height-to-weight tables typically do not go above 7 feet tall or below 4 feet 6 inches. 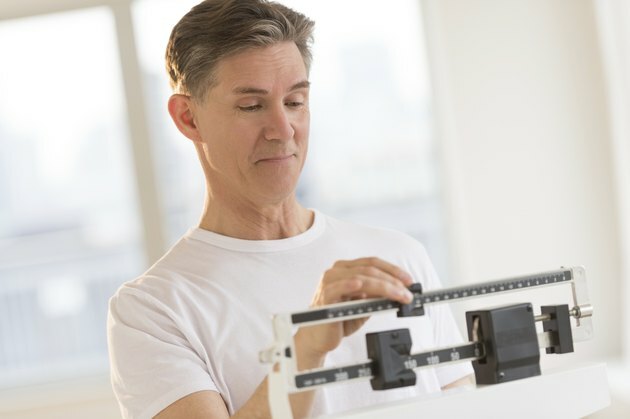 MNT: How Much Should I Weigh For My Age &amp;amp; Height?